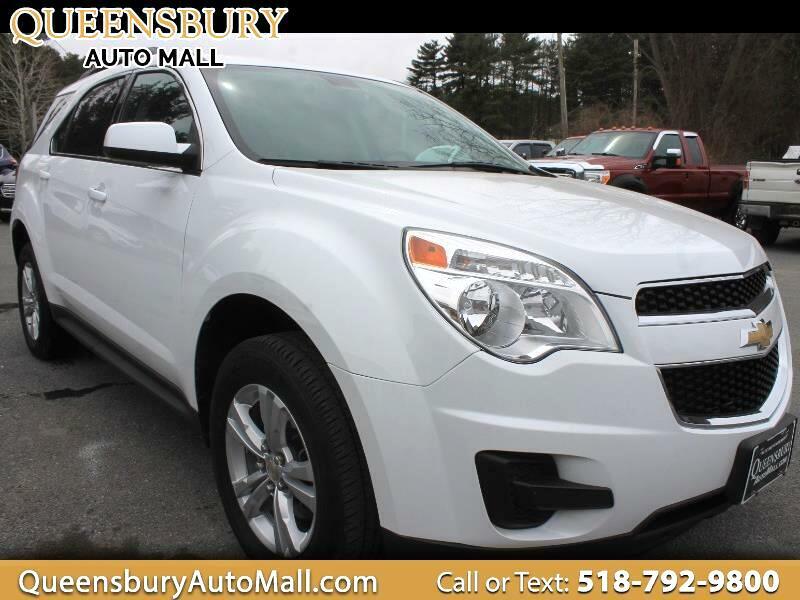 ***AFFORDABLE, ECO-FRIENDLY, GM MADE, ALL WHEEL DRIVE SUV - HERE'S AN AFFORDABLE ALL WHEEL DRIVE TAX TIME SPECIAL AT QUEENSBURY AUTO MALL - COME TO 635 GLEN STREET IN QUEENSBURY, NY 12804 TO GET A VERY LOW PAYMENT ON A WHITE DIAMOND CHEVROLET EQUINOX LT ALL WHEEL DRIVE WITH REASONABLE MILEAGE - TRADE YOUR OLD RIDE INTO THE AUTO MALL AND SAVE EVEN MORE $$$ ON THIS PRICE RANGE SPECIAL - DON'T MISS THIS STUNNING EQUINOX FOR THE RIGHT PRICE, LET THE AUTO MALL FAMILY UPGRADE YOU TODAY*** 2.4L L4 DOHC 16V MOTOR! ALL WHEEL DRIVE! FRONT POWER SEAT WITH DRIVER LUMBAR SUPPORT! LUGGAGE RACK! PREMIUM PIONEER AUDIO SYSTEM WITH AM/FM/CD PLAYER WITH AUXILIARY INPUT JACK, USB IPHONE INTEGRATION AND SATELLITE RADIO! FULL CABIN SAFETY AIRBAG CURTAINS AND SIDE AIRBAGS! SPLIT FOLD REAR SEATS! REAR WINDOW DEFROSTER AND REAR WINDOW WIPERS! FULL POWER EQUIPMENT! KEYLESS ENTRY SYSTEM AND KEYLESS REMOTE STARTER! ACTIVE ECO DRIVE MODE! ELECTRONIC TRACTION CONTROL SYSTEM! REAR VISION BACKUP CAMERA! ONBOARD DIAGNOSTIC COMPUTER! FULL POWER EQUIPMENT! SPLIT FOLD REAR SEATS! TILT/TELESCOPE STEERING WHEEL WITH CRUISE CONTROLS, AUDIO CONTROLS AND COMPUTER CONTROLS! ONSTAR COMMUNICATIONS SYSTEM! ALLOY WHEELS ON FRESH TIRES!